Maybe the kids have gone off to college. Perhaps you couldn't pass up your dream home even though it had one more bedroom than you needed. How you wound up with a spare bedroom isn't as important as what you do with it. It could be converted into a room for crafting or working out, you could use it as a storage space or you could transform it into a luxurious walk-in closet. One of the best things about your new walk-in closet is it will allow you to finally keep all of your garments and accessories in one place. 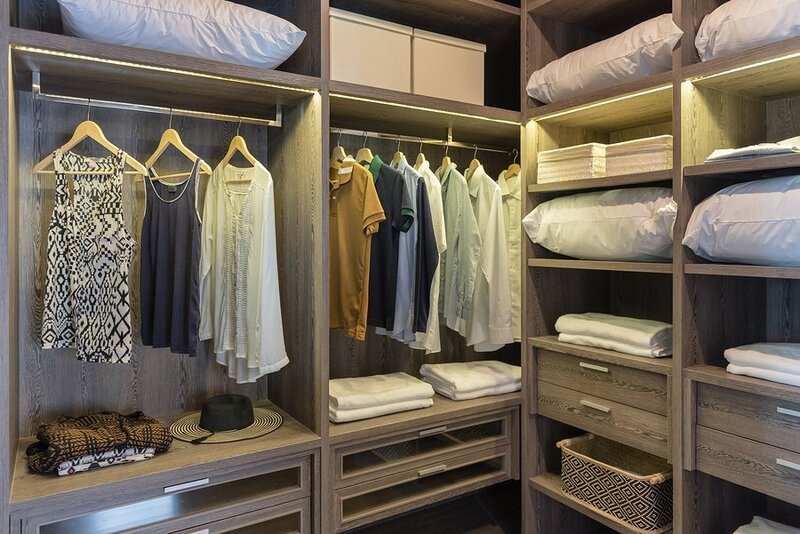 While traditional closets are often small and restrictive, an entire bedroom can be transformed into a walk-in closet with customized cabinets and storage spaces. Take a look at your wardrobe, accessories and other essentials and then customize the shelves, cabinets and storage spaces to accommodate those items. Lighting can be the difference between loving how you look and feeling like an outfit isn't working. Make sure you create a walk-in closet filled with flattering lighting. Avoid florescent light bulbs, as they tend to fill rooms with cold, harsh light. Recessed lighting and warm-toned lightbulbs will allow for optimal light that is comfortable and flattering. Consider adding interior shades to diffuse natural lighting and provide privacy. Transforming your spare bedroom into a luxurious walk-in closet requires various components like mirrors, racks, cabinets, light fixtures, a vanity, and shades to protect your privacy. Creating a customized space is exciting and fun, but it can be easy to go overboard on costs, which why it's important to begin with a budget and stick to it. Otherwise, you could end up spending more than intended.